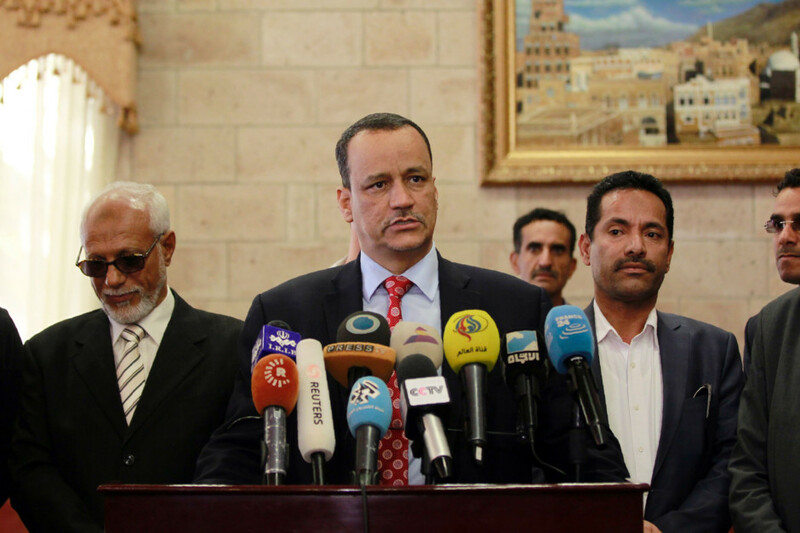 Al Mukalla: The UN envoy for Yemen, Esmail Ould Shaikh Ahmad, arrived Sunday in Sana’a in a bid to convince Iran-backed Al Houthi militants and their allies to attend fresh peace talks slated for next week. But Foreign Minister Abdul Malik Al Mekhlafi told AFP Saturday that the talks will not take place until January 20 at the earliest. The government met Al Houthis and their allies in Switzerland last month for six days of talks that ended with no major breakthrough. Meanwhile, in Yemen’s southern port city of Aden Sunday, President Abd Rabbo Mansour Hadi visited the airport for the first time since government forces replaced local resistance fighters. Hadi inspected the airport’s halls that are being renovated by the United Arab Emirates. Also in Aden, intelligence officer Ali Saleh Al Yafae was shot dead by unknown gunmen who opened fire from a silenced rifle, a security official told Gulf News. There has been no claim of responsibility yet. Also on Sunday, Al Houthis were accused by the US-based Human Rigths Watch group (HRW) of “arbitrarily rounding up” and “forcibly disappearing” dozens of opponents in the Yemeni capital. The international organisation quoted Yemeni lawyer, Abdul Bassit Ghazi, saying the militants were holding more than 800 detainees, most of them linked to the Muslim Brotherhood-affiliated Islah party. The Al Houthi movement is also charging a former spokesperson for treason for visiting Saudi Arabia. Ali Al Bukhiti, a young lawyer who strongly defended Al Houthi militants when they seized power in September 2014 wrote recently on his Facebook page that the Al Houthi Revolutionary Committee on January 6 charged him with high treason and supporting “Saudi aggression” in Yemen. Al Bukhiti, who defected from the movement early last year, has since been a vocal critic of the Al Houthi movement. When Al Bukhiti visited Riyadh in September 2014, he was accused by Al Houthis of betraying the movement. During the visit, he met with exiled Yemeni army general, Ali Mohsin Al Ahmar, a sworn enemy of Al Houthis. Since Al Houthis came to power, they have tried in absentia many officials who fled the capital, including Abd Rabbo Mansour Hadi. They have arrested officials who opted to stay in Sana’a. Meanwhile, Hadi on Saturday carried a limited cabinet reshuffle, appointing a new governor and many deputies to ministers. In a statement posted on the Riyadh-based Saba news agency, Hadi appointed Nihal Naji Al Awlaki as minister of legal affairs and Othman Hussain Al Majali as a minister of state for parliament and Shura council. Yasser Al Rouaini was appointed a minister of state for the implementation of national dialogue outcomes and Hani Bin Bourek a minister of state. These two ministries have been vacant since October when Hadi dismissed two ministers who backed Al Houthis. Hadi also appointed a new governor to the remote Island of Socotra and deputies to the ministers of education, planning and finance. Marwan Dammaj, the secretary-general of Yemen Journalists Syndicate, was appointed deputy minister of information. Hadi also appointed Ali Haitham Al Ghouraib, a senior member in the separatist Southern Movement, as undersecretary of the Aden province. The new appointments come a day after a snap visit by Khaled Bahah, vice president and prime minister to Aden.